When a pod crashes just outside London, our intrepid observer (unnamed protagonist) is at first curious. He watches as a lid slowly unscrews itself, and an alien crawls out. He only makes a run for it when green lightening chases down the watching crowd, scorching them all to death. He runs home, takes his wife to an out-of-the-way town, and for some idiotic reason heads back home. The rest of the book is his adventures on the way back to his wife. It also contains a short couple of chapters about the adventures of his brother in London – just to add some greater perspective of the story. 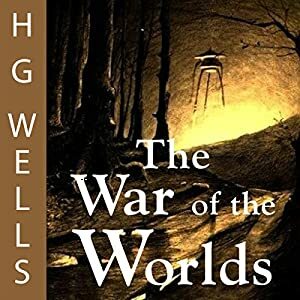 Despite the name of this story, War of the Worlds is about three pods that land in the London area it is not an en masse invasion. I think it’s interesting that yet again Wells wrote a book where the characters remain completely unnamed. Perhaps that’s meant to make the story more “autobiographical” or simply to say that events, not names, matter when something like this happens. I like to think of it as the second choice. If you’ve read past my spoiler alert, then you don’t mind if I mention that in the end of the book all of the aliens died from bacterial infection because they were not immune to disease on Earth. I think this ending was quite creative and forward thinking at the time. It also gives the reader a feeling of no control. No. We didn’t destroy the aliens with our brains and technology and sheer will to live. They were going to destroy us, and that’s that. But something completely out of our control is what saved us in the end. I thought this ending was quite fascinating when I read the book as a teenager. Then, when the Tom Cruise movie came out one of my friends told me “don’t see it, it has the stupidest ending, I’ve heard.” So I expected something really darned stupid to happen at the ending. When it ended, she turned to me to say “I told you so” when I pointed out that this is exactly how the book ended. She was like “it was based on a book?” That gave me a perspective that perhaps an ending outside of our control is too philosophical for most readers/movie watchers of the day? Perhaps we just want to see ourselves be in control of our own fate? I think it’s interesting to note that the ending to Independence Day also had a similar ending – a virus killed the aliens, but in this case it was technological warfare and not a biological infection that we had no control over. So metaphorical disease was there, just as in War of the Worlds, but the power was in our hands. I’m trying to think of some modern books (besides outwardly religious ones) where a similarly dire situation is turned around by something outside of our control. If I recall, there’s a very popular Stephen King novel that ends in a deus ex machina sort of way. I read the book in 1 day….could not put it down! One of the great science fiction books of all time. I think that the ending was not just creative but so very meaningful. I am in the minority here, but I thought that the Tom Cruise film may have been the greatest “Aliens invades Earth” film ever made. I thought that the 1953 version was also superb. I really disliked Independence Day for multiple reasons. It is a good book which can be consumed in one sitting. I find Wells' stories fascinating. I should actually read more to be able to have a more informed opinion, but I think he was very modern in his own ideas. I had also been told that War of the Worlds had a bad ending, but I also think the story wouldn't have been so powerful with another ending. Humans as helpless is not an abundant trope out there, and much less in films! I haven't seen the 1953 version, I'll have to check it out. My bf loves old movies, so it'll be a treat for him. Interesting you didn't like Independence Day, I thought it was hilarious. You should try reading some of his short stories if you haven't already. Very powerful. I've been meaning to do so for ages, but for some reason keep forgetting to start. Maybe next month? Thanks for reminding me! Hope you enjoy them, whenever you read them.